Letter From the Editors. Kevin C. Patterson. 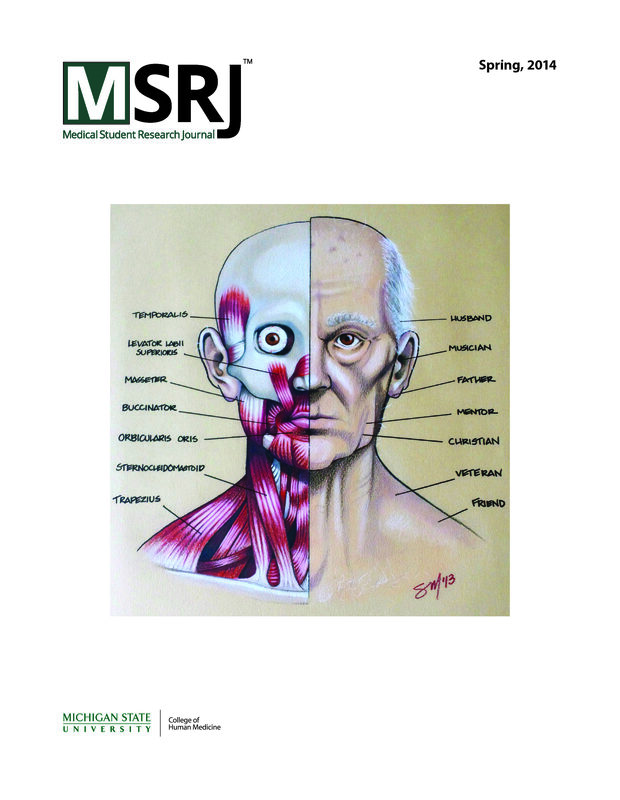 With the wrap-up of the 2013-2014 academic year, we are proud of the strides that Medical Student Research Journal (MSRJ) has made. The journal has grown in the number of issues as well as in the number of articles published per issue. In addition, the breadth of article types and topics has greatly increased. This spring issue includes works from the Royal College of Surgeons in Ireland, University of the East Ramon, University of East Anglia Norwich Medical School, and Michigan State University College of Human Medicine. Link here. The Anatomy of a Patient. Scott C. Mauch. My grandfather passed away the day after Christmas in 2012. He was a brilliant man who practiced medicine for several decades. During that time, he delivered thousands of babies, and even performed the amniocentesis on my mother when I was a fetus. Yet, in his last months, his failing health did not convey this brilliance. Parkinson’s disease and other neurological issues prevented my grandfather from speaking quickly or coherently. This was tough to witness, but it taught me an important lesson: there is much more to a patient than just the information contained in his/her medical file. This concept was the inspiration for my artwork. Link here. Future Medical Practice and Genetics. Alec J. Beaney. Significant progress has been made in the rapidly evolving sub specialty of medical genetics. In this article, breast cancer has been used as an example to highlight recent developments in this field of medicine, with a discussion on the implications this has on medical practice and policy. The potential of medical genetics is staggering but not without its limitations, and we must consider all aspects of use before advancing further. Consequently, students and physicians alike need to have a thorough understanding of all components of clinical genetics in order to be ready for this new era of healthcare. Link here. Leiomyosarcoma of Small Bowel Discovered by Double Balloon Enteroscopy: A Case Report. Malika Gill, Shabana F. Pasha, Matthew A. Zarka. Introduction and Patient Profile: Introduction of deep enteroscopy (capsule endoscopy (CE), balloon-assisted enteroscopy, and spiral enteroscopy) has led to a significant improvement in diagnosis and management of obscure gastrointestinal bleeding (OGIB). Small bowel (SB) lesions are traditionally discovered by CE or double balloon enteroscopy (DBE). Leiomyosarcomas are rare SB tumors and must be diagnosed early to prevent the risk of metastasis and to improve prognosis. A 46-year-old previously healthy woman presented with 3 weeks of abdominal pain and OGIB. Interventions and Outcomes: Patient underwent usual endoscopic modalities in identifying the source of her gastrointestinal bleeding. Computerized tomography scan identified intussusception of the SB; however, conventional endoscopy and CE were negative for etiology of source of bleeding. Ultimately, DBE successfully located the site of gastrointestinal bleeding, confirmed by pathology as a leiomyosarcoma of the SB. Discussion: Conventional endoscopy and CE may miss some lesions, while DBE can navigate altered SB anatomy, take biopsies, and even provide therapy to the lesion. Although double balloon enteroscopies are expensive and require longer sedation than average endoscopic modalities, they may provide another tool for the diagnosis of SB lesions when other modalities are unsuccessful. Link here. Isolated Orbital Mucormycosis in an Immunocompetent Adolescent. Jolie Krystle H. Guevara. Introduction and patient profile: Mucormycosis is a life-threatening disease that usually affects patients with diabetes and other immunocompromised states. However, recent literature has shown an emergence of this disease in immunocompetent individuals. Here we are presenting a rare case of a healthy 13-year-old adolescent diagnosed to have isolated orbital mucormycosis, previously treated with oral and intravenous corticosteroids. The patient presented with a chief complaint of left eye swelling of 3 weeks’ duration, which progressed to proptosis and a visual acuity of no light perception. Interventions and outcomes: Diagnosis of mucormycosis was done using histopathological techniques supported by radiologic imaging. Successful treatment of mucorymycosis was achieved via amphotericin B administration and orbital exenteration in this case. Discussion: The use of corticosteroids may weaken the immune system of healthy patients and can cause rapid progression of the disease. Early clinical diagnosis is important because this infection can rapidly be fatal. Link here. Patterson KC. Letter From the Editors. Medical Student Research Journal. 2014;3(Spring):44. Mauch SC. Anatomy of a Patient. Medical Student Research Journal. 2014;3(Spring):45-6. Beaney AJ. Future Medical Practice and Genetics. Medical Student Research Journal. 2014;3(Spring):47-50. Gill M, Pasha SF, Zarka MA. Leiomyosarcoma of Small Bowel Discovered by Double Balloon Enteroscopy: a Case Report. Medical Student Research Journal. 2014;3(Spring):51-4. Guevara JKH. Isolated Orbital Mucormycosis in an Immunocompetent Adolescent. Medical Student Research Journal. 2014;3(Spring):55-9.